Totally not kidding. There is a blog out there dedicated to teaching you how to make cookies that look like real flowers. It's called Blossomedge, and it is freaking amazing. These delectable treats are sweet to eat, because while they may look like flowers, they're made with flour. And the website features tutorials on how you can make them, too. If you don't want to hear more, I'm not sure if I understand you. If you do, well, you're in luck, because I interviewed Joanie, the blogger behind the magical creations. What is your favorite floral destination--hawaii for the exotic blooms? England for the lovely gardens? I love the flower gardens of Europe. When I was over there years ago, I was very inspired by the gardens of Germany and Austria. Tell me something that has surprised you about having your blog. I guess the thing that has surprised me the most about having a blog is the lack of comments, good or bad. Sometimes I feel as if I am putting out information into a great “void” with no feedback whatsoever… I often wonder if anyone is reading or enjoying the things I post. What's next? Actually, I have just started the “tour” of my floral cookie garden! 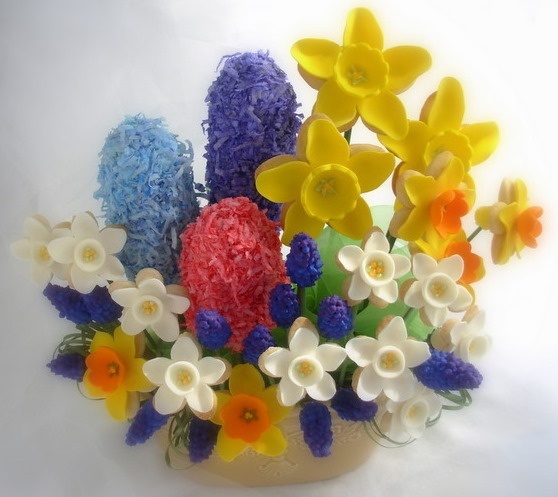 It is a vastone… I hope to surprise many by the flowers a person can create out of the most simple of popular confections. For more sweet deliciousness, visit the Blossomedge blog.